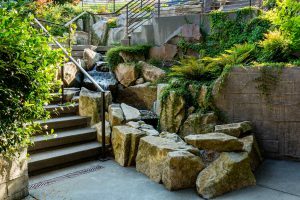 Seattle Landscape Architect Brooks Kolb is proud to announce the completion of a substantial new hillside garden in the Mount Baker Garden. Since the main floor of the house is at a much lower elevation than the street, an elegant concrete stair winds down past a dramatic waterfall to the front door. 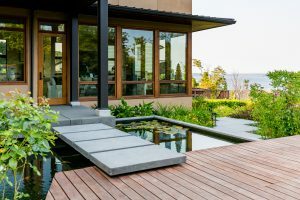 From the main stair landing, a wide gravel path loops around to the back garden, which features a tranquil koi pond and a mahogany observation deck with sweeping views of Lake Washington and the Cascades. On the north side of the house, a second stair descends to a lower level rental unit which has its own lawn. 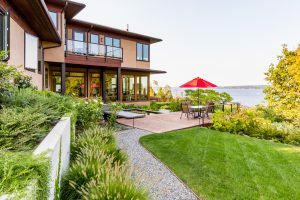 Lush plantings of trees, shrubs, ornamental grasses and perennials are distributed throughout the garden, while a variety of erosion control shrubs anchor the steep slope below the deck. Brooks collaborated with Turnstone Construction on the two contrasting water features.